Comfy Stim Combo Tens/EMS Unit,Feature a TENS and Muscle Stimulator combo unit complete with Self-Adhesive Electrodes Digital Display Dual channel stimulator with easy access dials and buttons. 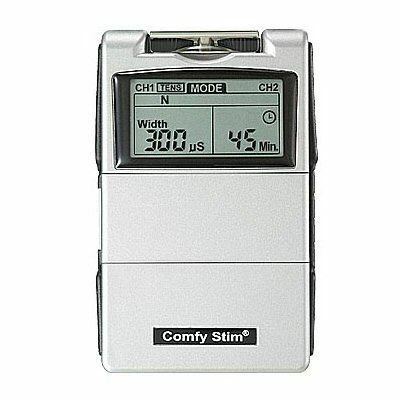 Feature a TENS and Muscle Stimulator combo unit complete with Self-Adhesive Electrodes Digital Display Dual channel stimulator with easy access dials and buttons. Feature a TENS and Muscle Stimulator combo unit complete with Self-Adhesive Electrodes Digital Display Dual channel stimulator with easy access dials and buttons, integrated timer function and excellent battery life. Features standard TENS modes: Burst, Normal, Modulation, SD1 (40%), SD2 (70%). EMS modes: Synchronous and Alternating. Alkaline 9 volts battery included.